The analogue technology of slides will soon cease to exist. For several years now, both the slide projection technology and the production of film material have come to a halt. Replacement equipment is becoming scarce and slides have become more or less unusable over the years. It is, therefore, all the more important to source analogue equipment in due time and prepare the transfer to digital media, for the purpose of preservation and presentation of this prominent collection of slide-based artworks (by Lothar Baumgarten, Nan Goldin, Ross Sinclair and many others). The focus of this project was on examining the various possibilities digitalisation has to offer. Yet it was also about critically questioning which losses digitalisation entails, as a last option of preservation. 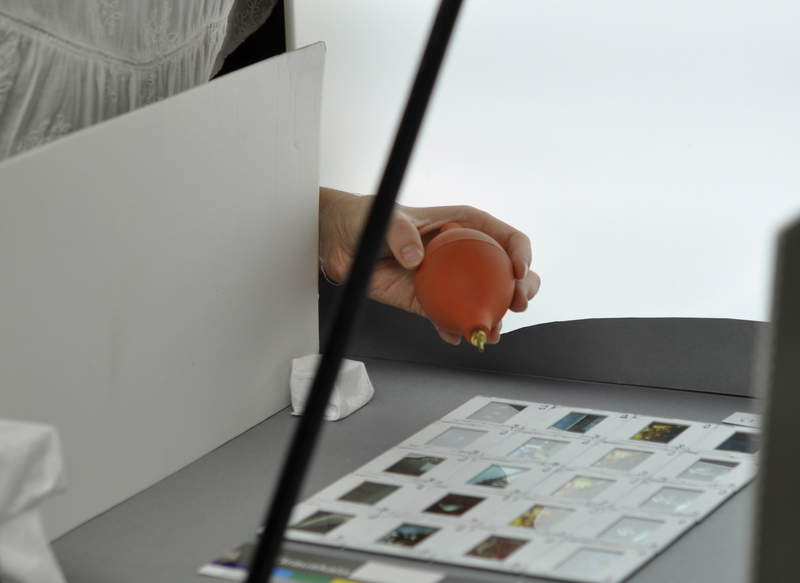 The project was based on the overall knowledge of slide-conservation established by the time-based media conservation department at Tate London. With the generous support by the Schoof Foundation over several years and additional funding through the Wüstenrot Foundation, we were able to conserve the holdings of slide-based artworks using the latest technology. In the course of the project and at its closure, results were published internationally, and communicated in workshops. Restauratorin in Ausbildung, Lisa Herold, dokumentiert die Dias der Kunstwerke. © Robert Barry, Sammlung Elisabeth und Gerhard Sohst in der Hamburger Kunsthalle. © Geert Goiris, Hamburger Kunsthalle. Hängende Projektoren und projiziertes Bild. © Hamburger Kunsthalle, VG Bildkunst 2016. © Nan Goldin, Hamburger Kunsthalle. Geöffnetes Dia Nr. 20 mit zwei orange-farbenen Folien und einem Stück Lithfilm™.